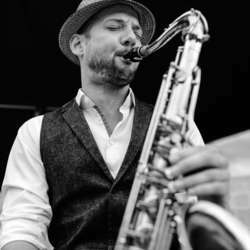 He indulges in tradition and modernity: the saxophonist Valentin Preissler gives his session debut in the Unterfahrt. On his debut, the native of Rosenheim presents a number of his own compositions and excerpts from his forthcoming solo album with musicians from the Munich scene. The jam session will start at 21 o clock, we meet together in the clubjazz at 20.00 to eat or drink and to have a chat. Everyone buys the ticket for her/himself.